Sometimes the most simple stuffs are the most appreciated ones. The same goes about this topic. There is nothing very geeky or some advanced feature of Dynamics CRM that I am going to talk about here. Yet these simple techniques would help a lot in your day to day CRM development. Open the Tools –Internet Option in IE Properties and then uncheck the checkbox – ‘Disable Script debugging’. The developer selects visual studio instance (existing or new) and then all the associated scripts are loaded and then debugging continues. The above procedure had multiple problems and the most common I faced is that Visual Studio hanged after sometime or IE restarted every now and then you are just drawn out of the flow where you were just about to decode your issue. Also many a times developers ended checking in the code in TFS missing out on commenting or removing all the debugger lines in the code and this code makes it to production. Well you needed to do all this till sometime back. But why not leverage the wonderful Developer tools that comes with each browser now a days. Not only you can debug your webresources most efficiently but also can do a host of other things. So let’s explore it together. 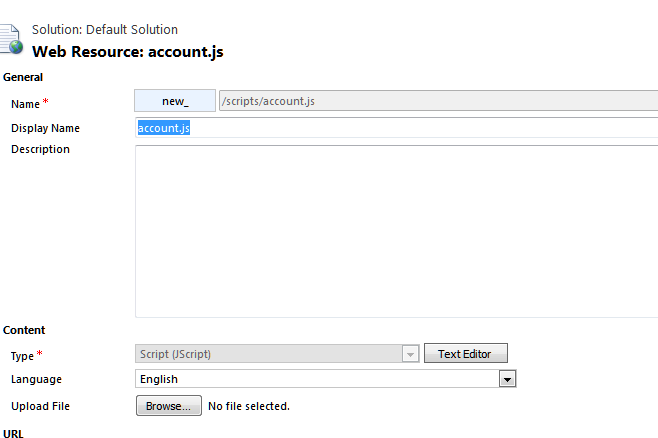 I created a webresource here named ‘account.js’ and upload it in CRM. The webresource is pretty simple. It contains a method ‘account_load’ from where the displayAlert function is called which displays the alert. The account_load method would be configured to be called from the form onload. Now when you do open the account record, you would see the alert. So let’s say you are getting an error during the form on-load. Now let’s see how can you use developer tools to debug this. While the record is open, press F12. I am using chrome here but you can use even IE and Mozilla. The developer tools open. You can find you script from the left hand pane. Now just refresh the record pressing F5 and then next time the debugger will stop at that position. You can now press F10 to F11 to debug as you want or press on the arrow highlighted in the above screenshot to pass through the entire script. Wonderful isn’t it? No more putting debugger statements in the code. Now say you want to find how your code executed and whether your code entered a particular execution block or not. The most popular way all this time has been using the window.alert method to identify the same. However after you go through what I will show you here now, I bet you will no longer need the alert methods. You can now use the console.log methods to determine your code execution path. Just check for the code below. Publish the webresource and simply open a new account record. However Once the record loads successfully, press F12. Once the developer tools load, just navigate to the console tab. All the messages that you wrote in the code through the console.log statements are displayed here. As you can see, all the messages are displayed in the console. No longer annoying alerts and everytime clicking on that to get rid of it. Thinking that’s all the developer tools brings to you. Off course not! If you are keen on exploring the Xrm Library and does not really want to mug up all the methods just like me, well you are in for a treat here. Open a CRM record and open the developer tools. Go to the console and select the appropriate frame. This is a very necessary step. Check for the screenshot below. Normally it is main.aspx or page.aspx. Now just type Xrm and you get the entire intellisense of your Xrm Scripts at your disposal. Believe me, you can leverage this to test any code for your Xrm scripts. If you ask me, I first test my entire code in the console and then make changes in the webresource all at once without going through the grind of making a small change and publishing every time to check if it is working. Hope this helps and saves you some time while you develop your webresources next time. Well, let me be very honest here. I hated to write this blog post. But to my surprise, I am finding lot of people wasting their valuable on this small stuff. So I thought, let me pen down this rather insignificant stuff so that it can help at-least someone stuck with the same issue. I am not going to document here regarding the word template generation feature of Microsoft Dynamics CRM 2016. 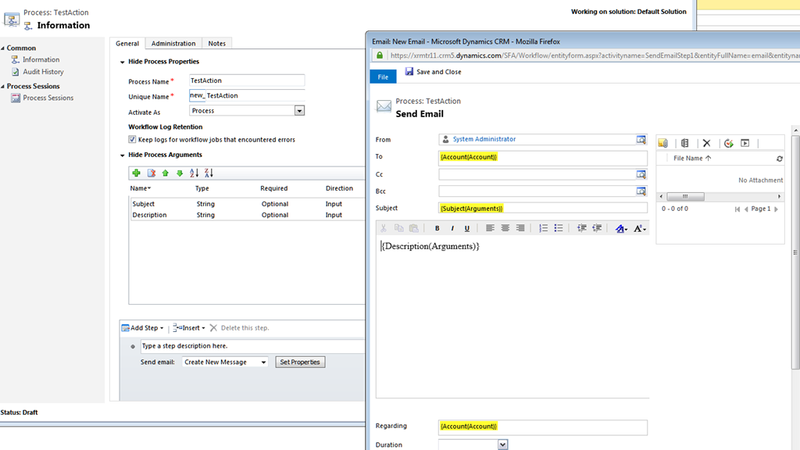 My personal favorite – http://crm.fueledbysleep.com/no-code/the-new-features-of-dynamics-crm-2016-how-to-use-them/#comment-3336 which explains both how you can use the word and excel templates to your advantage. Here I am going to explain how to generate repeating content, for example – show all the emails related to an account. First I download a template for the account entity. How to do it, you can find from the above post. As I am interested only in the emails, I have just included that relationship. Now I insert a table. I wanted to include From address, to address and the subject of the email. So I create a table with the appropriate headers. I select a 3×2 table as I need an empty row after my header. Now I select each of the three cells in the empty row of the above table and then insert appropriate fields. Another important point to note here is, if you want to display the From and To fields of the email, do not select the from and to. Instead select the fields – sender and torecipients. Otherwise the fields won’t display anything. Once the entire row is select, right click the relationship and then select Repeating as shown in the screenshot below. It would look like something as below once you are done with the whole process. The biggest mistake people do here is select the entire table or select the entire row from the border of the table. If you do that, the table won’t be visible at all. Save and upload the document template. To do this, please refer to the link I provided. Now once you view the template in the context of the account record, you can see all the emails. Pretty layman stuff but hope it saves you some time. 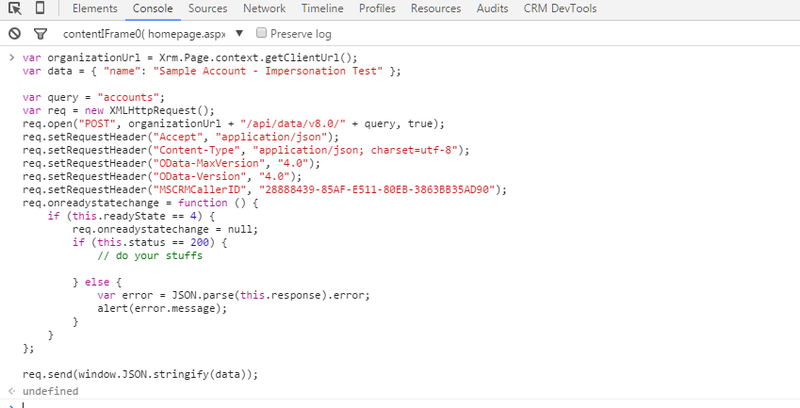 Continuing with my series of blog posts related to the wonderful Web API of CRM 2016, in this blog post, I will explain how to execute custom actions through Web API. No more use of creating complex SOAP queries from the client side to invoke your action. The wave of Web API is here to sweep off the old established complex rules. Let’s create a custom action here. I name it TestAction for the account entity. Below is the screenshot for the same. As you can see the, the Action is pretty simple. I have two input parameters for the action – ‘Subject’ and ‘Description’. All the action does is send an email with the Subject and Description populated from the input arguments of the action. I activate the action. Now let’s get dirty with the code to invoke this action from the client side. "Subject": "Invoking from Web API"
Like I do all the time to test my code, this time also I open CRM in my browser and pull up the powerful developer tool’s console. I press enter and CRM does the magic! I check my emails and this is what I get. Never mind the two records created here. I was so excited that I ran the code twice. Similar to this, you can call your global actions also which are not bound to entity. Below would have been the request URL if new_TestAction would have been a global action. Please note you do not need to use the full qualified namespace for calling a global action unlike the action bound to entity. Hope this helps! 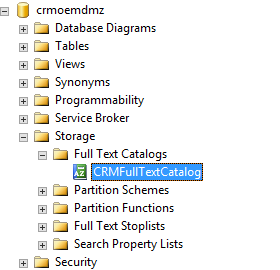 Till you read one of my blog posts, happy exploring CRM 2016. Generally, by default CRM provides tab order from top to bottom. But sometimes depending on the requirement or for professional look and feel we come across Left to Right order in CRM forms. 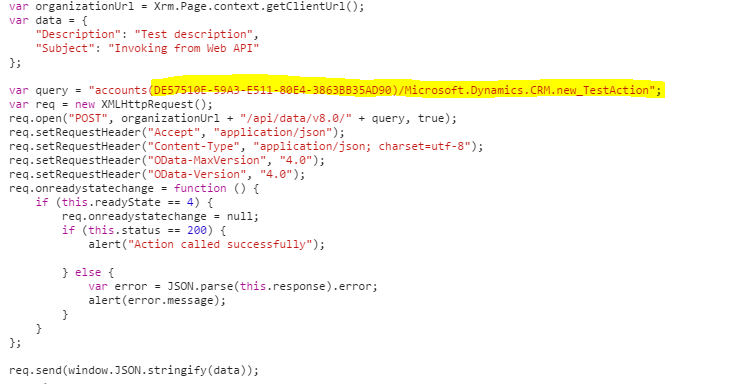 I have been exploring the Dynamics CRM Web API features and frankly speaking it never ceases to amaze me. So today I am going to explain how you can impersonate a user to create a record from the client side. Wondering how can we impersonate from the client side. After all, till this time, plugins were the privileged objects to do something in impersonation. Well, then Web API has come to shatter many establishments in the CRM society. I have two users in my CRM system. System Administrator and my account. I am going to login with the System Administrator account and then create an account on behalf of my account (Debajit Dutta). Below is the code to do the same. Let me explain the code a bit here. Here I am creating a account named “Sample Account – Impersonation Test”. However I am creating the record under impersonation. The GUID of the person whom I am impersonating is passed as the MSCRMCallerID in the request header. “28888439-85AF-E511-80EB-3863BB35AD90” is the guid of the user – Debajit Dutta. So how do I run the code? If you are thinking, a new webresource needs to be created and uploaded in CRM and then the code is to bee fired based on some event, I am not going to do nothing like that. After all we have the very powerful developer tools of modern browsers at our disposal. So why go the traditional way to try your piece of code? I opened CRM in Chrome and then pull up the Developer tools in Chrome. In the console I copy-paste the above code. I press enter and voila! the new account is created. Now If I pull up the record in Advanced Find. Below is the screenshot of the same. So as you can see the Created by is the user whom I impersonated and the Created By Behalf is the user who actually performed the operation. The power of Web API allows you to do this impersonation in just 10 mins or so and that too from the client side. Isn’t it great!